Brown graduated from Portland State University and moved to Vancouver where he got a steady gig playing with the guitarist Tommy Chong.Martha Reeves happened to be at one of his gigs and hired him in 1967 to join her band Brown played for Reeves and the Vandellas for a couple of years (she gives him a shout out on her unreleased Live at the Copa album) before Motown hired him away as a studio musician and to travel with other Motown acts. Martha Reeves led to a contract with Motown Records. After that contract, Brown recorded with some of the biggest names in the Motown industry, including Martha and the Vandellas, Stevie Wonder, The Temptations and Marvin Gaye. Back in the 1970s and 80’s session drummers such as Mel were not recognized because it was not policy to print the names of session musicians. The purpose of a session musician was to record in the studio or play with the band on stage, but they weren’t actually part of the band. In 1973, Brown moved back to Portland Oregon and made it his permanent home. 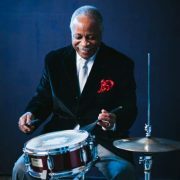 Five years later, Brown created a trio band with piano player George Mitchell and bass player Phil Baker. For two years, 1978–1980, Brown toured with Diana Ross and the trio band he created. Brown owned and operated The Mel Brown Drum Shop until 1984 and then opened a bookkeeping service which he called Metropolitan Accounting and Tax. He maintained his music career playing gigs and performing different shows throughout the Portland Jazz District. Brown created the Sextet, performing every week at The Hobbit in southeast Portland. Brown had the opportunity to record and play with Leroy Vinnegar and the two of them started a Hammond B-3 organ quintet. In the 1990s, Mel was added to the board of directors for the Mt. Hood Jazz festival and created the Mel Brown Jazz summer camp workshop located at Western Oregon University. In the 1999 Brown was inducted into the Jazz Society of Oregon Hall of fame. Throughout his career he also played and performed with the Oregon Symphony.